I received my beautiful package from Pixie Wonderland @ Etsy yesterday. I ordered a custom decoden iPhone 5s case and I was able to customise it to my exact specification. Katie sent me photos of the cabochons, resin pieces, figures and gems that she had in stock and let me choose the layout that I'd like for my case. I then had the option of white or pink whip! She kept me updated every step of the way, sending me photos of different layouts before she actually put it all together to check if I liked it. Katie actually makes her own resin pieces which is fabulousss! She also sent me photos once she'd set the pieces into the silicone just in case I wanted anything extra added before it dried. I'm so pleased with the quality of the case and the extent to which I was able to customise it. Sooo.. here's my case! 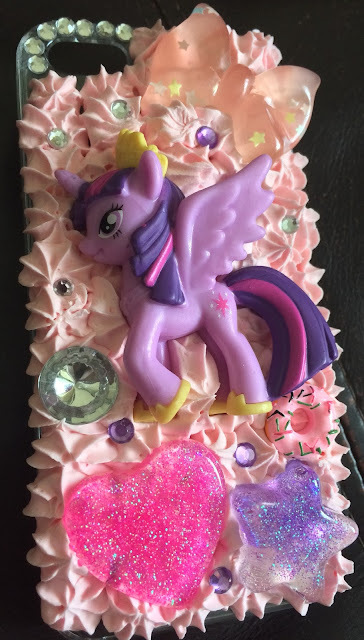 I went for a Princess Twilight Sparkle case with glittery resin pieces around the outside, a donut cabochon and some gems set in there too. Katie was kind enough to send me a guide to looking after my decoden case and a bag of extra rhinestones too which I love. Considering it came all the way from America, it arrived super fast and international shipping was cheaper than I expected! The cabochons and rhinestones feel securely set in to my case and it really is beautiful. It's exactly how I wanted it to be! I also ordered 3 hair bows on alligator clips which are very cute as well. They're nice and big which I love and they feel sturdy. 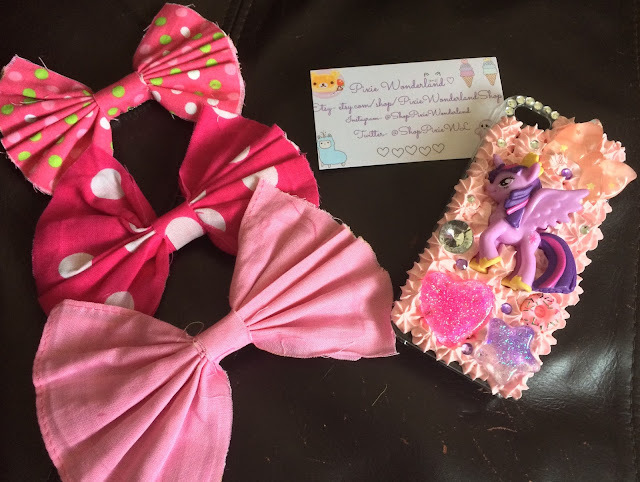 I would wholeheartedly recommend Pixie Wonderland to anyone who is looking to purchase a custom decoden case! Katie also makes Lisa Frank cases which are beautiful. Nothing is too much trouble for her and she will definitely look after you and keep you updated throughout the process. Reach Pixie Wonderland on Etsy, Instagram and Twitter. Katie frequently posts pictures of her work on social media so she's definitely worth a follow!